35 BOTTLE CHANDELIER made for Rouxpour restaurant. 35 BOTTLE CHANDELIER installed at the Rouxpour restaurant in Friendswood, Texas. 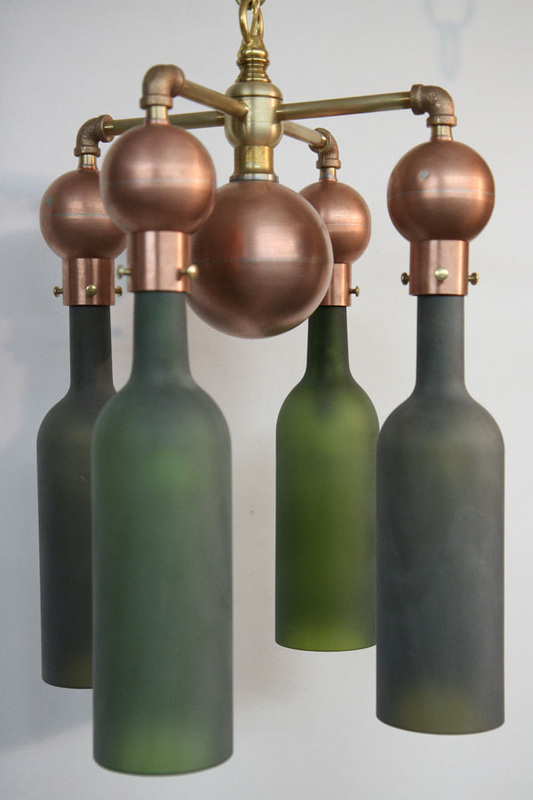 THE 35 BOTTLE CHANDELIERS are made of a copper sphere as the center armature to which the sockets, made from copper pipe, are attached. 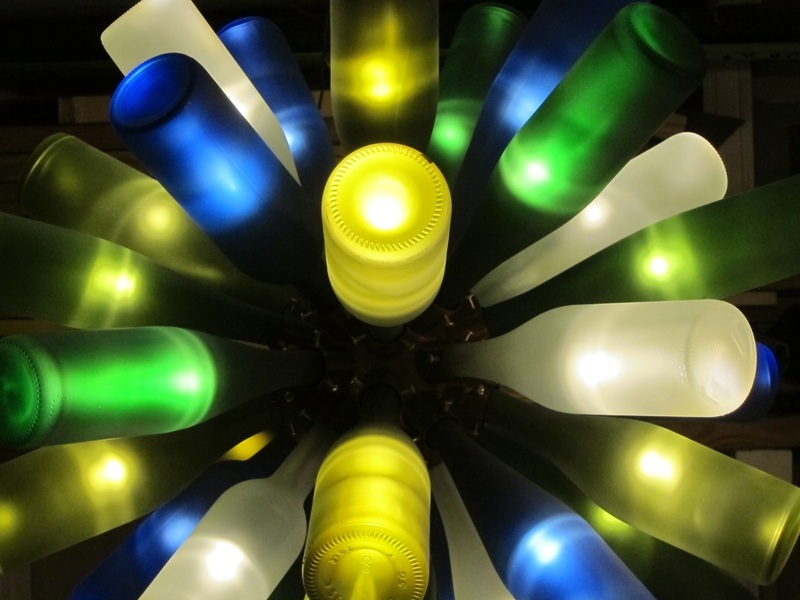 The bottles radiate from from this armature creating a starburst of colored light. The light bulbs that illuminate this lamp are 12 volt, .06 watt LEDs that require a transformer that is included with your purchase. The light bulbs have a lifespan of 30,000 hrs. 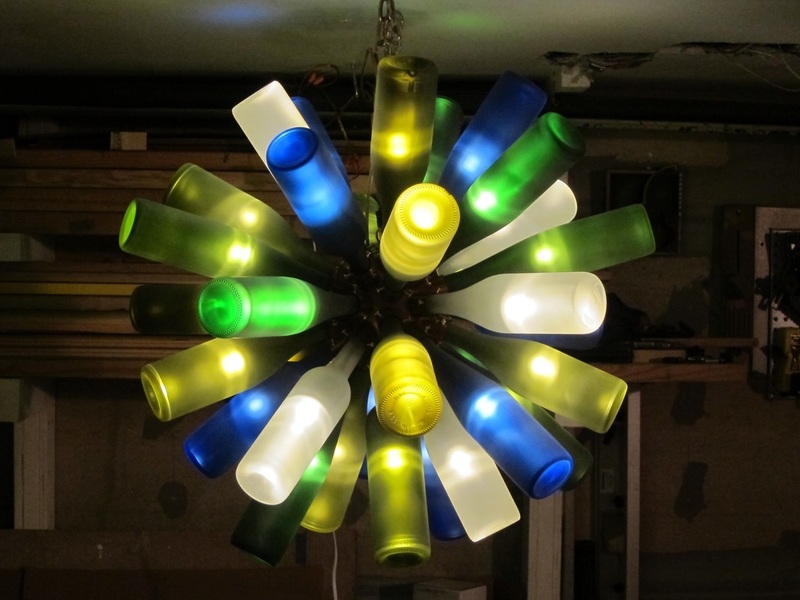 The 35 bottle chandelier is 30" in diameter. They come with all the necessary hardware needed for hanging. They weigh 50 lbs. and require a support to accommodate 100 lbs. 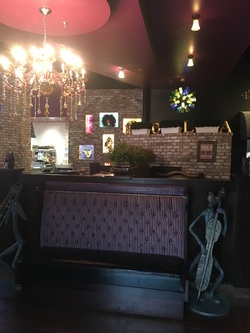 The chandeliers pictured here show bottles arranged in a random design, but can be arranged in a number of ways: all the same color, all the same shape, all clear, mixed clear and frosted, etc. Finishes – I offer natural finish or a polished finish. The natural copper color will transform to a beautiful patina, actually protecting the copper as it ages. Lacquer finish can be applied. Lead time is usually three to six weeks. 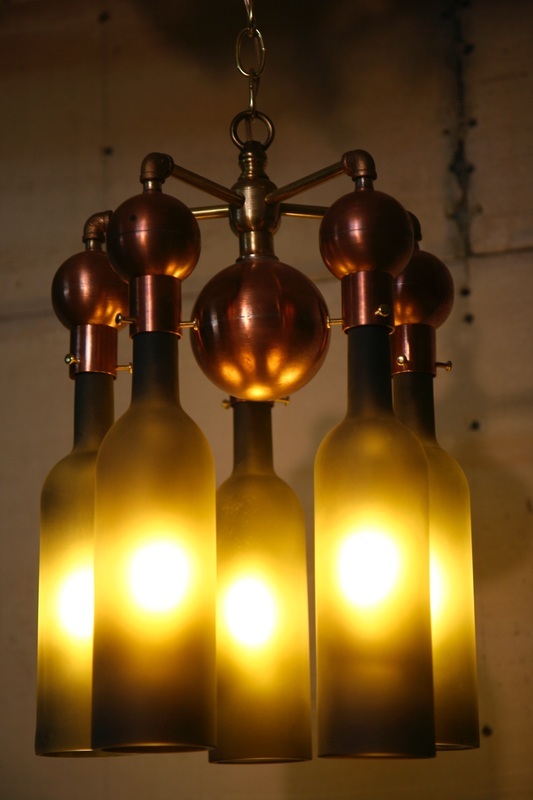 THESE 4 BOTTLE CHANDELIERS are designed to be used in residential locations that require low lighting to enhance any number of interior spaces such as above a dining room or kitchen table, in a entry, hallway or foyer, as well as commercial applications like a cafe, restaurant, wine bar, wine store, wine cellar or even a winery tasting room. They are constructed of solid copper and brass plumbing and electrical parts. The bulbs are energy saving LEDs (included) that last longer than standard incandescent bulbs and they do not get hot. They can be made to hang from a chain as pictured or from a copper or brass pipe. Finishes – I offer natural finish or a polished finish, lacquer finish can be applied. 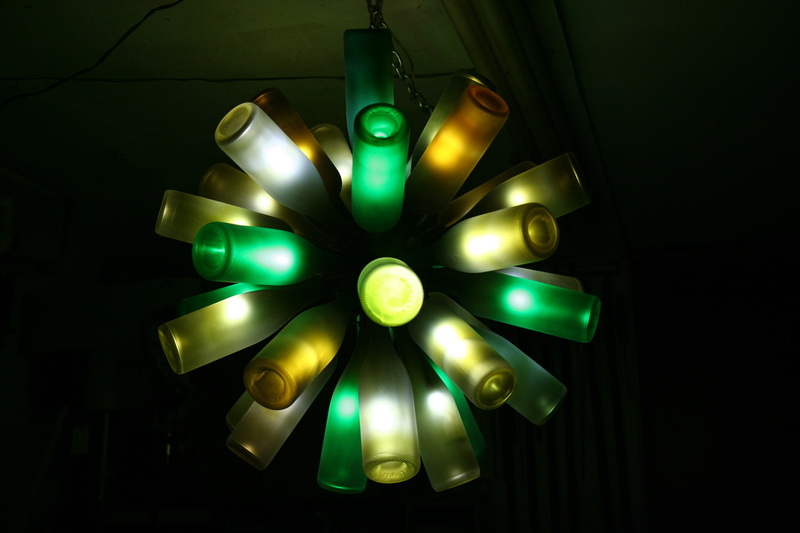 Bottles come in a variety of shades of browns and greens or Clear glass. Approximate dimensions: 16" high and 9 - 3/4" wide. All lamps are handmade, no two are exactly alike, and will be made to customers specific needs. Lead time is usually three to five weeks. 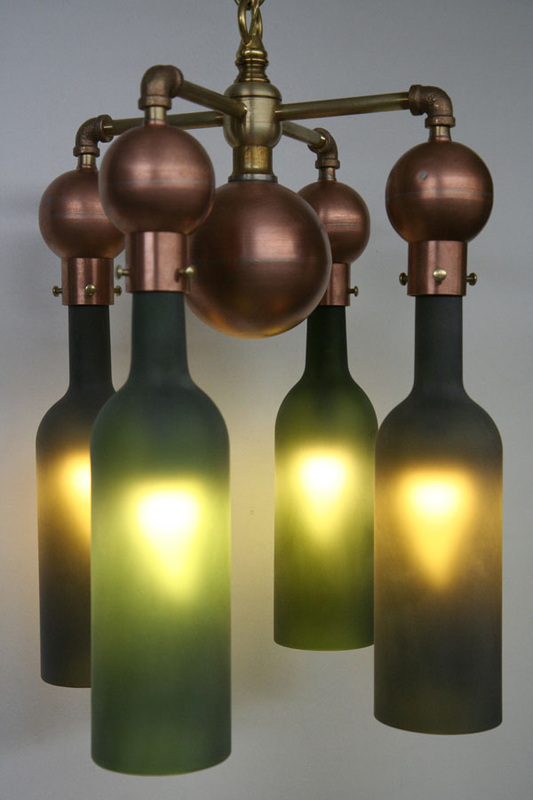 THESE 5 BOTTLE CHANDELIERS are designed to be used in residential locations that require low lighting to enhance any number of interior spaces such as above a dining room or kitchen table, in a entry, hallway or foyer, as well as commercial applications like a cafe, restaurant, wine bar, wine store, wine cellar or even a winery tasting room. 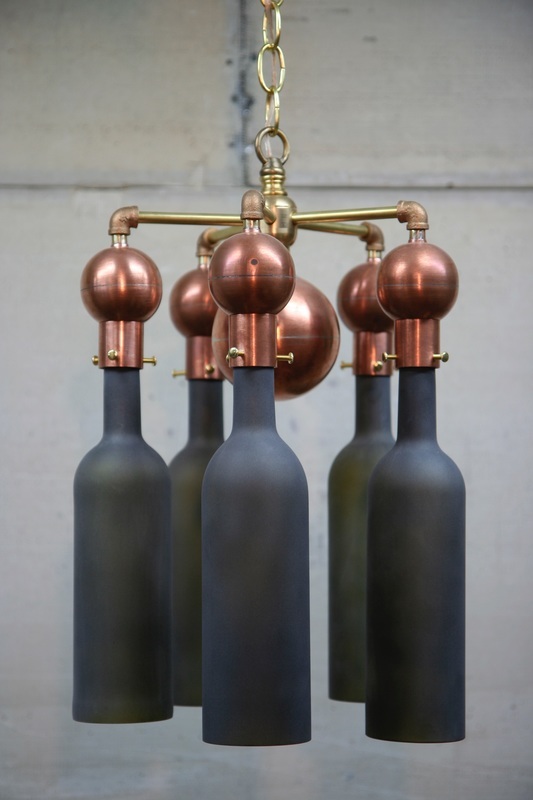 They are constructed of solid copper and brass plumbing and electrical parts. The bulbs are energy saving LEDs (included) that last longer than standard incandescent bulbs and they do not get hot. They can be made to hang from a chain as pictured or from a copper or brass pipe. Finishes – I offer natural finish or a polished finish, lacquer finish can be applied. 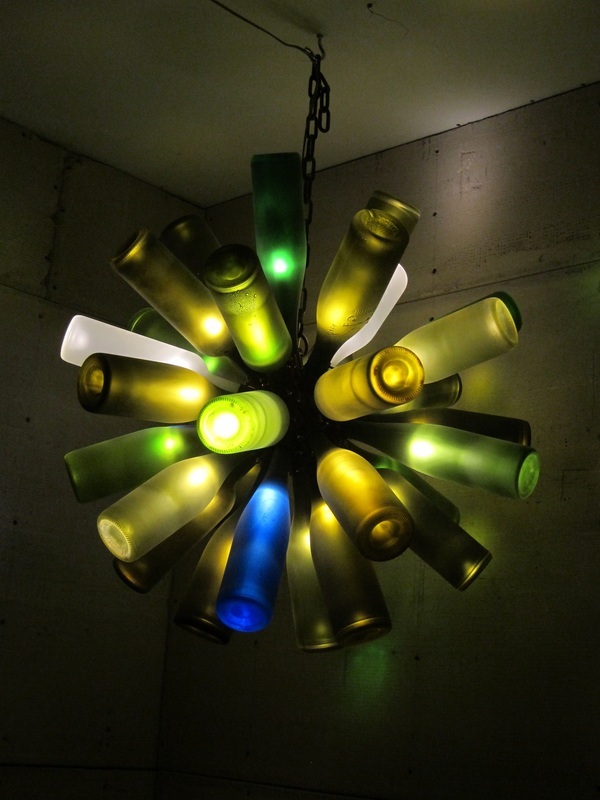 Bottles come in a variety of shades of browns and greens or Clear glass. Approximate dimensions: 18" high and 9 - 3/4" wide. All lamps are handmade, no two are exactly alike, and will be made to customers specific needs.